The pizza boxes have been thrown away, the people that helped you move into your new place have gone home for the day, and now it’s just you, surrounded by half-emptied moving boxes. If you’re like most movers, you probably did a lot of deep cleaning and purging prior to your move, getting rid of old items with the promise of replacing them with something fresh and new. Well, now the time has come for acquiring those replacements or getting additional items. But what exactly do you need to buy after moving into your new home? It depends. Let this list of things to buy when you move into a new home guide you into determining what purchases you need to make. You can get many of these items at stores like Walmart or Target, or through online retailers like Amazon. Online delivery options have the added benefit of allowing you to spend less time out shopping and more time settling in. 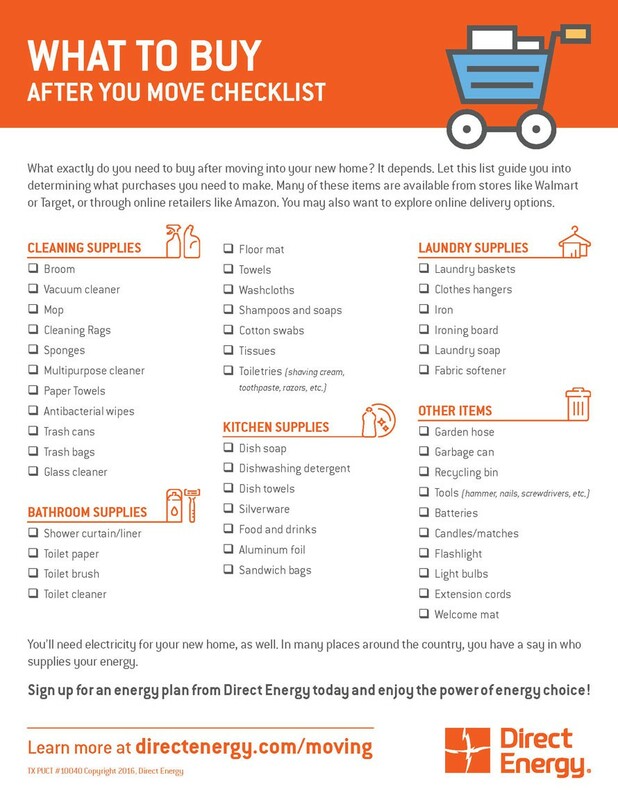 Click here to get a printable checklist for what to buy after you move. Your new place may look nice, but you can't assume that your new living space will be sparkling clean and sanitary. Use these items to make sure any surfaces that you’ll spend a lot of time in contact with are clean and safe for you and your loved ones. Again, your bathroom may look decent at first blush, but you don’t know how thoroughly it was cleaned. You deserve a clean and sanitary bathroom, so take the time to make it sparkle and shine! You did throw the pizza boxes away, right? It’s time to break out the pots and pans and start cooking delicious homemade meals. Check out for easy meals you can whip up while you’re getting settled in your new home. We even have recipes that help you use less energy in the kitchen without sacrificing on taste! Ditch the laundromat (or your parents’ washing machine) and take care of your own laundry at home. Make sure you have everything you need to keep your clothes looking as presentable as possible. You may already have brought these items over from your previous residence, but if you didn’t, here’s your reminder to purchase them. Your new location may provide garbage bins, recycling bins, or both, so check with your landlord, homeowners association, or others. Some municipalities provide trash receptacles to residents free of charge, so a little investigation may save you some money. Whether you’re moving into your first apartment or house or you’re a veteran of many moves, you likely still need electricity. In many places around the country, you have a say in who supplies your energy. 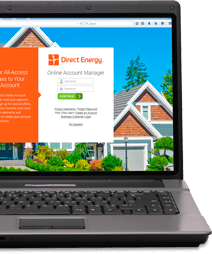 Sign up for an energy plan from Direct Energy today and enjoy the power of energy choice!